Following the announcement of EB and Depeche Mode’s team-up for their European tour, our editor-in-chief Max Dax met the DM’s vocalist last November in Paris for an exclusive interview which we present in its entirety in both video and text. Last time we met we were talking about Miles Davis and John Coltrane and you were referencing how important the music was for you. I don’t hear any influence of them in Depeche Mode’s music. How come? Well, I wouldn’t say that. I think there’s plenty of influence in there in terms of experimentation. The use of modern day instrumentation and experimenting with it, and putting it into a format known as popular music. So, to me, that’s where the influence is. And also the freedom that’s in jazz and blues—I hope there are some of those influences that go into what we do when we produce a Depeche Mode record. Certainly it does when I’m writing. I don’t like to be restricted to a format, really. It’s difficult with popular music because a lot of popular music confines itself to particular structures, but I would say the music that we’re making now definitely has some strong blues influences to it. Lyrically as well as musically. You said, “How can you listen to a John Coltrane record without the cover?” We were talking about records in the wake of iPods. Now big companies like Telekom announce partnerships with Spotify, streaming is supposed to be the new thing. How do you see it as a musician and artist? It’s very difficult, it’s a good question.Technology has changed so much in the last 20 years and certainly in the last ten years it’s just become so accessible to be able to find and get whatever music you want, and then to have it immediately put onto a device to listen to. It wasn’t so easy when I was a teenager. I think there’s room for everything, I think that’s very useful but I think we’re losing the ability to take time to actually take something in. Technology is great when you use it, but it’s not so great when it uses you. By having Anton Corbijn, I think it shows you put much effort into having a visual aspect that stands for the band. Do you think you can stop certain trends or is it not a contradiction? I think that Anton Corbijn over the years, certainly in the last 20 years, has become an integral part of the development of Depeche Mode visually. We work hand in hand and he enhances what we do music-wise with his visuals. That can be a photograph, that can be a film that we use onstage to enhance a particular song or a moment in a particular performance. I think Anton understands our music, and I think for a while we were lost in the early days looking for something that was visual to latch onto. Anton really was the key that unlocked that door for us. At the same time, the challenge is always to change it up and to do something different and to create a different image or a different visual that will enhance that particular record or that particular live performance and we hope that we’re able to do that. One of the challenges of making music is to constantly change. You’re only as good as the people you work with as well and the people you introduce into the project, and that will enhance the songs you are working on, have ideas that will take them down different roads. Sometimes, quite often, roads you don’t want to go down but you have to follow the experiment and see where it takes you and keep an open mind. That can be scary sometimes. You mentioned Miles Davis early on and I remember reading a quote of his that said, “You’re only as good a musician as the people you put around you.” Because he, of course, was a fantastic musician but he was also smart enough to know that he had to challenge himself all the time with other artists, other people that he respected or he felt were as good as him, or that could bring something different to his production and to put his instrument in a different setting. That’s what you have to do; you can’t rely on past successes to enhance you as an artist so that you grow. The only way you can do that is to try different things. For me, personally, it’s become apparent that I’m a much better artist when I go outside of Depeche Mode and work with different people that I wouldn’t necessarily feel was within my comfort zone. Last year I was lucky enough to make a record with Soulsavers and we wrote and recorded a bunch of songs together and I enjoyed that so much and it definitely influenced my writing for this particular Depeche Mode record. So you say you have to rely on new people, people you didn’t know before. How is it with technology, everyone has a iPhone, I’ve seen you have one, too. Everyone uses apps, what about apps like the Kraftwerk app where you can generate your own music? Do you use these little things to jot down ideas? I do. An app that I use a lot is the voice memo on the iPhone which I find very useful. In my house in New York, I have a small setup where I have a microphone and some speakers and a small PA system in a room so that I can immediately, if I have an idea, play some kind of melody line or chords from a piano. I can play those down and then perform live and stick my iPhone in the background and switch it on VoiceMemo and I’ll have a reference immediately. Then I’ll immediately be on my computer through iCloud, so I have backup of that. My engineer noticed recently when he was backing up my iPhone to save things that I had 16 hours of ideas on my phone and I said “Oh really? I’ll have to look back at some of those!” Some of which are definitely ideas of things that developed into songs that are on this new record and things that, in the last year, that became Soulsavers songs. Did you notice, using the camera with your cellphone, that it changes the way you perceive time, that you memorize things because you basically have your visual diary on your phone? I actually use the camera on my phone a lot in all kinds of situations, could be document something that I need to remember, pictures of friends that are going to be calling me, and also just a library, as you say, a library of photographs and memories and short films that I now have on this device that I can look back at any time. That’s the kind of technology that I think is really enhancing, but then again you’ve got to be careful of all this stuff, you’ve got to remember to look up sometimes when you’re walking down the street staring at your device or texting a friend or opening an email. I have to take time to always remember to take a look around me because that’s where the ideas come from, they don’t really come from this thing. I can use this device to help enhance ideas but it’s the world and friends and family and situations that inspire me. In 32 years Depeche Mode have, to my knowledge, never ever done a big partnership with a corporation like Telekom, how come you changed your mind? How come it becomes possible? Is it because of the difficulties with record companies? I think that, with us, the use of technology goes hand in hand. We’ve always used technology to our advantage and like I said earlier, as long as you don’t let the technology use you… Our partnership with Telekom, for instance, enables us to first of all couple up with technology, modern day technology, and also at the same time to have our music heard by a larger audience, quite possibly. Times have changed in the music business—there’s many, many ways for people to hear music; our attention spans for taking something in, I think, have become shorter, so you have to get clever and use different possibilities to introduce people to your music and new ways to find new people to listen to your music. If you confine yourself to one area, that’s all you’re going to get. Using technology actually is, I think, a great way for us to introduce people to the new music that we’re making. I was surprised how soon you get acquainted to these things, when we were streaming your press conference yesterday it seemed so normal that these things are happening now when two years ago it wasn’t normal at all. At the same time you could see a wall of snapshots taken with cellphones, so it brought it all together. Using—when we did the press conference yesterday—this idea that came through my manager and his assistant Alex to create this wall of interactive photographs that was a count down of an announcement of when we were going to go tour. So already we were engaging people in the world of the internet, if they wanted to or were interested, to be interactive with what we were doing. And it came off really well, I mean to be able to sit there in front at a press conference and have a film made as well, quickly uploaded, put onto a screen—these kinds of things, even five years ago, may or may not have come off. Immediately it was broadcast over the internet, through our website, through Google, people were immediately texting me, “Ah, I saw this, I saw you on your thing, I see you’re going on tour again.” This is how you have to use technology nowadays if you want people to know about what you’re doing because not so many people are picking up a magazine or listening to the radio. That’s not to say that they’re not doing that at all, but you have to be smart about how you let people know that you’re doing something. Many people do this via Twitter. Depeche Mode now have 1.2 million followers, Lady Gaga has 30 million. Are you envious of Lady Gaga? No, it seems like it’s a lot of hard work being Lady Gaga. She can do that, she’s good at doing it. The outfits alone, to put on that kind of show every day, an exhibition, let’s see how long she can keep that up. I’m very comfortable with the way my band has grown over the years, the work that we do, our place in music. I feel that we do have a place, I feel that we’ve been influential over other artists and people that like our music. We couldn’t really want for anything more. I don’t know how many more bands there will be who can sustain 30 years of a career, if you like, of making music together because the world has changed and music has changed and the way that we listen to music has changed. I think it’s much harder for artists these days to develop something slowly and with some mystique still involved and some mystery, because everything is so instant, we want to see everything immediately. Celebrity has become more important than the content on some levels, which is kind of sad to me, but I think that as well is almost running its course. I know that my children, for instance, are looking for content always in whatever interests them. My son sits there, he can be playing a video game, he has his laptop, he’s watching a TV show, in one corner he’s talking to some friends, in another corner he’s listening to music while he’s playing a videogame. It’s mindboggling to me, sometimes I come home from the studio and I’m like, “What are you doing?” He’s doing everything. At the same time. It’s crazy. I had a chat with Daniel Miller yesterday and we were talking about loyalty and he said this nice sentence: “Loyalty breeds loyalty.” I think you have some of the most loyal fans in the world and I think you can be proud of that. One of the things in this partnership is that we are doing this crowdsourced fan art exhibition. What do you expect from involving the fans? I think you’re going to be overwhelmed by the participation—of how much our fans will participate in what you’re offering them because they like to get involved, they do get involved. If you’ve been to a Depeche Mode concert you’ll know that you don’t go there to stand and watch, you go there to be part of it. Also, in terms of loyalty, our fans have been loyal to us and, like Daniel Miller says, loyalty breeds loyalty, and we’ve constantly tried to make quality music to the highest of our ability and I think that’s why we’re still able to do that. One last question, about the new album. You gave us an interesting insight into the sound of the new album, it’s very sparse, I think it’s a nocturnal thing, it sounds like it was recorded at night. Read the cover story interview by A.J. 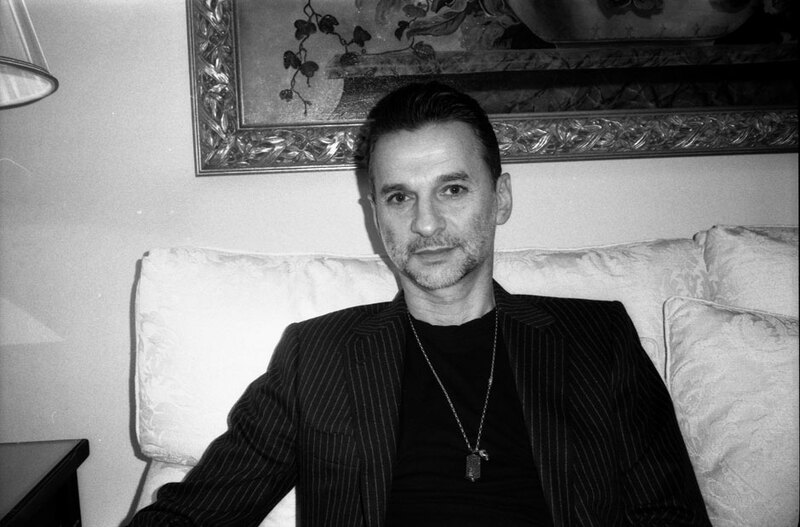 Samuels with Dave Gahan from our Spring 2013 issue here. Watch Depeche Mode’s exclusive Vienna concert and Delta Machine album launch event here.